In December, gas tanks of Apple watchers got a surprise dose of high octane when reports surfaced the company was buying online music service Lala. Some immediately speculated that Apple had plans to create a "cloud" friendly iTunes. Others chimed in on the possibility of Apple using Lala’s intellectual property and license relationships to offer an iTunes music subscription package. 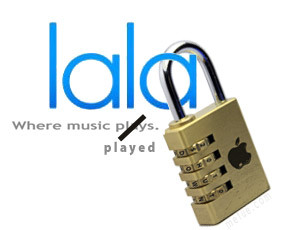 Now, just a few months removed, rumor engines are spinning again on news Apple will shut down the public face of Lala’s services a week before the start of Apple’s World Wide Development Conference. The termination of Lala’s services were announced on the company’s website with a pledge Lala subscribers will receive iTunes credits as compensation for non-downloadable songs they’d previously purchased. Lala, which was founded in 2006 initially as a CD trading platform, built its core business around streamed internet music. The company allowed subscribers to buy streaming non-downloadable songs for 10cents a piece. Lala also sold songs outright and offered tools that let users upload and mirror their personal music libraries in Lala’s web environment. Apple has not commented on its plans or what the future holds for Lala’s technologies. Is new functionality for iTunes on the way? Probably. Will it debut in June? Possibility but don’t call that a sure thing. Even though a music announcement could be a compliment to any mobile related products (aka iPhone 4) announced, there’s a greater probability any iTunes changes will wait. Any big modifications to the iTunes distribution model could require license agreement revisions with music partners and that could take months. For betters, the safe gamble is to look for any changes to iTunes resulting from the Lala purchase to come no sooner than August or September "back to school" announcements. The summer will be an iPhone/iPad focused quarter. Monday Night, Apple shut down Lala as planned. According to Venture Beat, the chatter factor surrounding possible iTunes news at the WWDC is "trailing off" rather than gaining steam.